Want Top Dollar for Your Injury Claim? We have 15 offices so we are near you. We will come to you if you want. We help get your car repaired and a free rental car. We get you the best medical care. We get your lost wages paid. We make sure your medical reports are accurate. We get you all the insurance benefits you need. We get your creditors off your back. We give you memorable customer service. We will counsel you every step of the way. We get you a top dollar settlement quickly. Personal injury lawyers charge a 1/3 of your settlement fee, so you want to hire the lawyer who will get you the best settlement. A good lawyer doesn’t cost you more, they get you more. Choose a lawyer who has many years of experience in handling cases like yours and has an office near you. $250 Million Recovered… for our clients over the past 30 years. * See our Google Reviews and Best Settlements. No Fee Guarantee… means we charge the standard 1/3 of your settlement fee only if we get you money (and no hidden extra costs). 20 Years Experience or more, is what every lawyer has in our firm in handling personal injury cases in RI & Southeastern, MA. 15 Offices in RI & MA… so we are conveniently located near you. Corporate office is at 2540 Pawtucket Ave. East Prov., RI. For More Reasons Click Here. They were amazing with getting my case settled quickly and effectively! I couldn’t have asked for better people to help me than Robin and Lisa. Thanks again for everything d’Oliveira & Associates! I called d’Olivera & Associates right away after my accident because they were so highly recommended. They worked so hard on my case, and always kept me informed on what was going on. Thank you! READ OUR GOOGLE+ REVIEWS FROM LOCAL CLIENTS LIKE YOU. *This figure is for gross settlements for injury cases, along with past due and ongoing benefits for workers comp and SSD cases, as well as cases where we referred out a case to outside counsel and maintained joint responsibility. 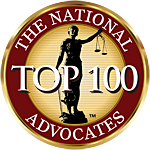 Only Attorney Paul d'Oliviera has a 10.0 Avvo rating, is a member of the National Trial Lawyers (Top 100 Trial Lawyers) and a member of Trial Masters.